Why is the Government not appointing the Vice-Presidents of the ITAT? Whether the move of the Government to merge the ITAT with other Tribunals is justified? 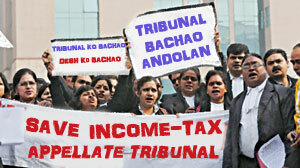 The Tax Bar has failed to understand why the Government is not keen on appointing 8 Vice-Presidents in the ITAT. The last appointments of Vice-Presidents were on 24-11-2009, however, thereafter till date, no further appointments of Vice-Presidents have been made. The Tax Bars across the country have made representations to the Government to appoint the Vice-Presidents at the earliest from amongst the Members who are eligible. When a person serves the institution with honesty and integrity, he expects a promotion which he deserves as a matter of right. By not appointing deserving members as Vice-Presidents, the morale of the honourable members may go down. By appointing the Vice-Presidents, the administration of the ITAT will improve and taxpayers will be benefitted. The Honourable members being in judicial service, cannot make this representation to the Government. In R. S. Mittal v. UOI, JT 1995(3) SC 417 (420/421), the Apex Court directed that the recommendations of the Selection Board for recruitment of Tribunal’s Members headed by a sitting Judge of the Supreme Court must be placed before the Appointment‘s Committee of Cabinet (ACC) expeditiously and preferably within two months from the date of recommendation and a time bound procedure should be followed. In the Finance Act, 2016 w.e.f. 1-6-2016, the Govt. has abolished the post of Senior Vice-President. No explanation was given in the notes on clauses as to why the Senior Vice-President post was abolished. It is Bar Associations which can take up such important issues with the Government. We make an appeal to all the stakeholders in the interest of the institution that the issue may be taken up with the Hon’ble Prime Minister of India and Honourable Law Minister. If no response is received, as a Bar, being the custodian of the Institution, we may have to knock the doors of the Judiciary.